Here it is ! The Zoid that is the very first to my heart, the ultimate one, and maybe the most sought after one. Let's do a little Ultrasaurus Red summary. Ultrasaurus Red is seen in a Tomy official catalog, in 1987 (the photo above), the same year than Red Scavenger and Zabre. Some persons saw it in this catalog and waited a lot, but it was never released in France, nether in Germany or another european country (at least, it is what was beleived at this time, and very late after). After, when I was speaking of this Zoid, nobody seems to have ever heard of it. 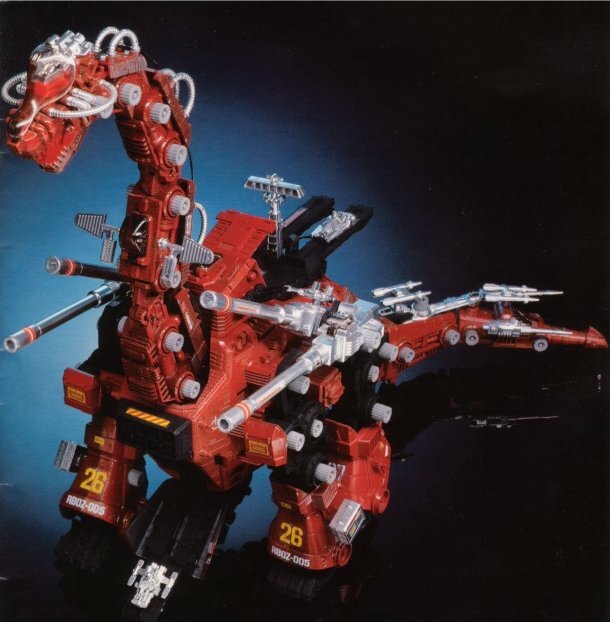 It is only in 2000 that I met someone who has also seen this Zoid : Dominic Smith. He knew the photo, and he also remembered seeing it in a TV advert (in which was also seen a black european Deathsaurus), but never in shop. The same year, Dom made his UK site and put online the 1987 photo. A lot of interrogations were occuring between the Zoidfans, but the conclusion was that this red Ultrasaurus never came out anywhere, and that there was no really hope to have to find one. All the mention of this Zoid that could be found on the web or elsewhere came from persons who where knowing this Zoid because they saw the 1987 photo. Even Leo Shop made a chrome one, identical to the photo. It is only in 2003 that in one month, three different events happended about this Zoid. First, there was two pieces in a lot that seems belong to him. After buying the lot, I discovered that they were repainted. Repainted as if it was for the Red, but repainted. During the same time, I saw an ad of someone in UK searching this Zoid. After speaking with him, I realize he was knowing Ultrasaurus Red because he saw it in shop during the eighties. And just after appeared the incomplete Ultrasaurus Red on ebay, which was sold right away to-we-don’t-know-who. It was the first time this Zoid was seen, we got some photos of it and of the instructions booklet. No photo of the box, but we know that we can see on it Redhorn, Red Scavenger, Ultrasaurus Red and maybe Zabre or Shield Tiger (I think it should be Zabre, in 1987, Shield Tiger was not released). So the fact is that it was released, in UK (and probably only in UK), with some differences with the prototype (black neck instead of red and red canopy instead of brown). There was also a contest where you can win one during the same period. This Zoid was also seen in the countries around UK. In 2004, a toys dealer in France told me they use to have it 3 or 4 years ago, bought in Spain to someone from UK. The second time we can tell this Zoid was somewhere around us. I also learnt in 2005 that another one was seen in 1998 in UK at a convention, MIB this time. A friend of mine send me this photo of parts from an Ultrasaurus. Those were found among OER UK parts, so there is chance that they come from an Ultrasaurus Red. But as you can see, they can also come from a japanese black one. The thing that can make us think that they are from a Red, is that they were found in UK, in a OER lot, without parts from other Zoids series. And they can't be from a Zoids2, because the Zoids2 has a grey light cable, and not a black. Only the japanese Ultrasaurus and the red has a black. An Ultrasaurus Red could be seen on the internet since 2004, this one. It is a custom, made like the one of the auction (thanks Andy). April 2007, another item of it is spotted, always in UK. There was some wondering about his reality, and we learnt just after it was a painted model. The funny thing is that it has the "5" stickers on the legs, and the red insigna at the same place than the one of the auction. Why was it done like that ? All the photos here. An information that could be taken from those photos : the stickers on this one, and on the 2003 one are not from Ultrasaurus. On the OER Zoids that were changing colours, the stickers remained the same (appart for the insignas), but not on this one. It is in both case Red Scavenger stickers that were used. Why those stickers were used ? May 2009, I received a message telling me that Ultrasaurus Red, with Deathsaurus, were both released as promo items, to around 20 units each, in a white box, like the Ghost Zoids. Unfortunatly, I don't have a picture for that. Now, what will be next… ? No need to tell that if you have any info on this Zoid, contact me and it will be a pleasure to add the news here. By the way, I made my custom of Ultrasaurus Red, in 2000, here is a photo. Well, no new for a long time, we can ask yourselve, is Ultrasaurus Red really existing ? I must say, no. If we take a look carefully, first of all, the 2003 model seen on auction is not a real Ultrasaurus Red. I took a look more closely at the photos, and we can see that it is a repaint Zoids2. On the front photo, you can see that inside of the legs, to colour is blue, like the Zoids 2. I was a little suspect about this 2003 Ultrasaurus Red, we now can say it is a Zoids2. And the booklet ? Well, a fan-made one. - On Pheno, "Andy" was showing an Ultrasaurus Red, supoosed to be a custom, with Red Scavenger stickers. - The person who was selling the 2003 supposed Ultrasaurus Red was named "Andy". This Ultrasaurus Red was wearing Red Scavenger stickers too. - The person who told me he saw Deathsaurus and Ultrasaurus Red in white boxes was also named "Andy". - And the person who shew us an Ultrasaurus Red on Zoidspoison, and told us few days after it was just a custom, without any other explaination, was also "Andy". - I must also add "Andy" was the person who told us about the Ghost Zoids, that were supposed prize contest, something that was never verified after. So I now must admit that a lot of things I said before about Ultrasaurus Red are WRONG ! There is no possibility to say that it was released, and it was probably not, as Deathsaurus. The only testimonies I can keep is one from a person who told me having seeing it in shop, and another in a toy show (but I can't even say if those are reliable too).